Year 1 are continuing to use the very exciting online reading scheme called Bug Club. This is in addition to reading that we already ask the children to do at home and very useful if a reading book doesn't make it home over the weekend! 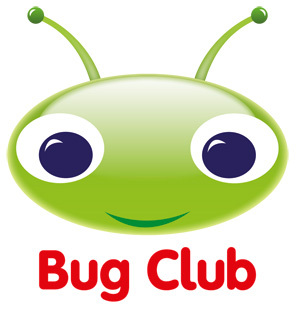 There is loads of really interesting information about Bug Club on their website and it might be worth having a look through before allowing your child to use it independently. With my support in class, the children have logged on and together we've gone throught the steps that need to be taken to begin reading their books and completing the 'bug point' comprehension questions. Everyone in class has already earned themselves 2 bug points - what a great start! We have allocated a series of books to the children, and they can choose the book they like the look of best to begin. The books can be read through completely, and then the children can return to answer the bug questions, or they can click on the bug to earn points as they read each page - it's really up to them! -Enter the school code, username and password. You'll find your child's individual username and password inside their reading records. To track the children's use of Bug Club we are able to access each of their individual accounts to ensure the level of the books are correct for their ability and through monitoring their answers to the comprehension questions, we can also ensure that they are able to interpret the text fully. There are several video tutorials which you can watch which explain how to make the best of the site. It is possible to run the site on Android devices and iPads. To do so you will need to download the Puffin Reader App. Once downloaded everything should work. Enter the same web address into the Puffin browser (www.bugclub.co.uk) and away you go. Password: stuck in the front of the reading journals. We are keen for these still to be used, dating when paper books are read as well as ebooks. We are still encouraging follow-up work to be completed at the conclusion of paper books and ebooks. We would still like to see reading journals twice a week just noting what has been read and signed by a parent. New books will be sent home on a Monday and a Thursday - on a Friday, I will make sure that Bug Club books have been updated, and this is what they will focus on over the weekend. Most importantly, please continue to question your child about what they have read, plot lines, characters, settings, feelings, themes, predictions and anything else. This will help you to understand how well they are interpreting their text. Please remember this Bug Club is a complement to our current reading structure at Mount Pleasant. Paper books are just as important as ebooks! If you have any questions at all, please don't hesitate to contact me on medhurstpleasant@gmail.com, or if you'd like to see me after school please make an appointment and I can talk through the scheme with you. The chidlren and I are very excited about it - I hope you will be too!